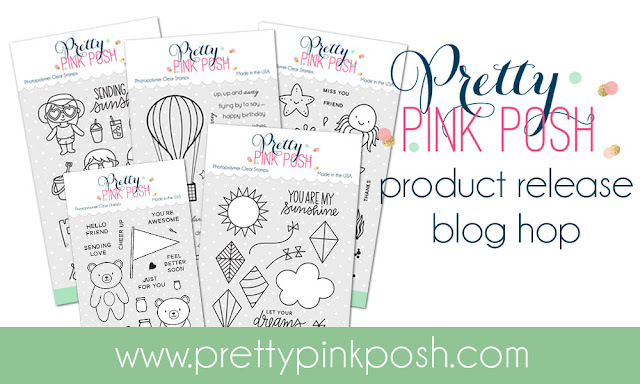 Hi friends, today I'm hopping along in the second day of the Pretty Pink Posh product release blog hop! Yesterday we had the first lot of designers sharing inspiration, now were onto day two of sharing the new release and honestly it's a super amazing release so you won't want to miss checking out all the inspiration! There are four $25 gift certificates to be given away in this blog hop (two per day). So make sure you leave comments on the blog's comments to be entered and they will then be picked randomly and announced on the Pretty Pink Posh blog. Make sure you leave comments by 11:59PM PST time on the 18th July 2017 to be entered into the giveaway! So for my card today I used the new Summer Friends stamp set to create an ocean scene along with the Scallop Rectangles Dies and Clear Droplets from Pretty Pink Posh. To begin my card today I first stamped and coloured my images from Summer Friends with Copic Markers. I made sure I used bright colours to help set the scene for summer. Once they were coloured, I die cut them out using the coordinating dies. While I had my die cutting machine out, I also die cut a Scalloped Rectangle Frame out of white cardstock. For my background I went to my go to thing to do which is use Distress Inks. I pulled a couple pieces of Tim Holtz Watercolour Paper and first I used Tumbled Glass and Salty Ocean for the sky and then used Mustard Seed and Fossilised Amber for the Sand. I then flicked some water onto the sandy piece to give it some more texture and then for the sky background, I took my favourite stencil from Tim Holtz, the Rays stencil and placed it over top of my sky background. I then sprayed a ton of water over top of the stencil. I left it there for a little while and then pressed a cloth over top to mop up the water. When I pulled up the stencil it revealed a bleached look, I really like how it turned out. Now all my elements were done I could adhered my card together. I adhered my sky and sand pieces together using tape adhesive and then used foam tape to adhere my frame on. I then also used foam tape to adhere all the kids in a line on my card as well. I used the 'Sending You Sunshine' sentiment from the Summer Friends stamp set and stamped it into the middle of my card with black ink. To finish up I added Clear Droplets around my card and adhered my panel to a card base. Thanks so much for stopping by today, the next person on the hop is the fabulous Christy Reuling and don't forget to comment to be entered to win the prizes! Oh my goodness Eloise this is SWEET! I am heading out to the beach myself in a few minutes so I'll have to watch your video tonight! I just HAD to check these all out before I left! I love the rays coming out from behind them! AND this stamp set is my favorite !! WOW! Adorable card and I love the sentiment. Great job! Just adorable! You've captured summer fun perfectly! those pretty heart sunglasses. Lovely card! Super cute card.... Love the added dimension. This card is absolutely adorable! I love your color choice! I love this release!!! Really fun summer card! I love the bright colors and cheerful look! So fun and colorful! Thanks so much for the inspiration! Adorable card. I love it. Love how bright and summery your card is! Great card. You have to love those heart sunglasses. Too cute. Hi Eloise....sensational card! Fabulous color choices; you always inspire me with your creations. Love this card! Beautiful ink-blending and coloring! Great card. Love your techniques. Those heart glasses are too cute! Thanks for sharing. Oh wow...your card is so sweet! It would make anyone smile with its bright colors and them holding hands...so cute!! Awesome card! I love everything about it. This card is so sweet! Wonderful job coloring! I also love the strips of red at the top and bottom of the card! Super cute fun card!!! Love it! Thank you for sharing! Love how you grouped the images together! Love the bright colors and the extra touch of droplets really give the sense of water. TFS! I used to think pretty pink Posh was only sequins but boy was I wrong they have the cutest stamp sets I am Head Over Heels for this July release! And I love Eloise! She is extremely talented and has a Fresh Approach to everything she makes. Love your coloring and your video! Really cute card! Love the sky! Very cute and colorful card--those kids are adorable! Such a cute card! Love the summer friends. Adorable card! Thanks for the video. That's cool! Thank you for the video! I liked the sky! Such a cute card 😊 💙 thanks for the video. Cute and colourful card. They look like best friends out to enjoy a beautiful summer day - pure bliss with wonderful memories! Such a cheerful summer card! It is so happy! Great card! I am loving those little kids! They are so cute! Great coloring! Great PPP release! Loving this hop with all of it's talent and inspiration! Thanks for sharing yours! I love every little detail.... the PPP frame die you chose, the darling way you colored / arranged the people, and I especially love the way you colored the background!! Fabulous! Great use of these little beach kids! This is the cutest card!!! OMG, your creations are too cute!!! I love blog hops because they inspire me to create. Adorable scene !! Congratulations ! 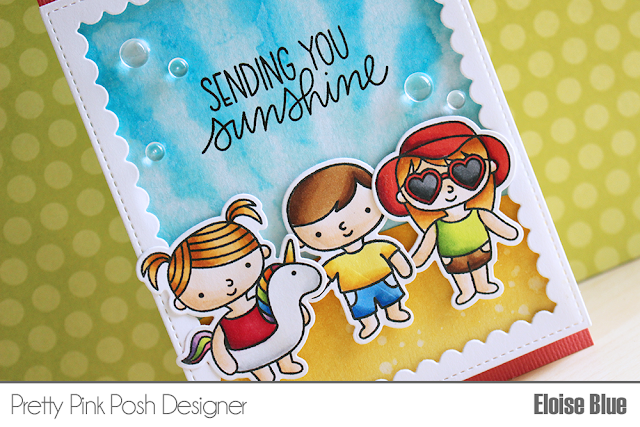 Awesome coloring on your adorable card! Such cute kids. Good bright colors and design. Thanks for sharing. Very cute and colorful summer scene. Adorable kiddos!! Love the unicorn inner tube!!! I love the rays coming out from behind them! 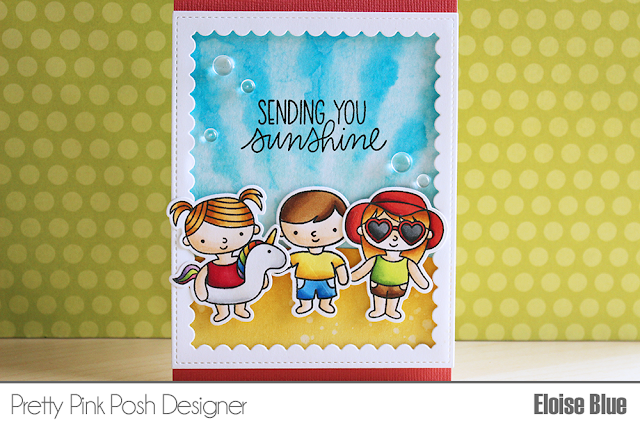 Love your card and this release is just adorable! Cute card!! So many great stamp sets in this release and this summer friends set has such cute little kids and other images in it as well. The background you created is fabulous and adds a lot to it. So fun!! I really love your card and those cute beachy kids! What a great way to showcase this new, awesome release! Cute card. Love the pop of red color. Your card is just adorable - having 4 very young grandchildren, I love these cute little kiddos! Thank you! Very cute card...love the sweet images. Lovely summer card!Thank you for sharing! Adorable shaker card, I love your coloring!! Loving the sunglasses. Might have to get this set just for them.